"Once you have it...it never leaves you"
Story of the first 1000 pound grander black marlin ever caught on rod and reel. Join Dean Reiner on an extraordinary trip to Christmas Island in the central Pacific Ocean. Over the years, Joe Branham has developed several tools to make the tying of his flies faster. Joe says "One of the best has been my Crab Trimming Tool." Joe Branham's excellent overview on tying materials for the salt. Joe is one of the world''s best saltwater fly tiers. 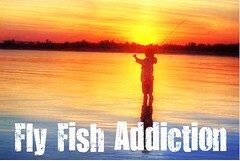 Joe Branham writes and presents here outstanding articles on the practice of saltwater fly tying. Welcome one and all to the wonderful world of tying flies for the "Salt". My name is Joe Branham and I will be your guide through this exciting area of fly tying.